On a bitterly cold day in early February, hundreds of Northwestern students gathered near the Multicultural Center to protest an executive order by President Donald Trump temporarily banning immigration from seven Muslim-majority nations. It was one of many powerful moments this year for Muslim student Fidak Khan ’19. 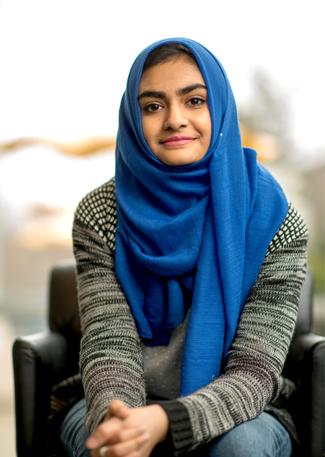 As the Associated Student Government senator for the Muslim-cultural Students Association, the sophomore has worked to raise awareness about issues concerning Muslims at Northwestern. Weinberg magazine recently sat down with Khan to learn more about Northwestern’s Muslim community and why the McSA’s work matters more now than ever. What role does the McSA play on the Northwestern campus? We provide Muslim students with a community and a safe space. Even though we’re only a community of about 80 to 100 undergrads, we have a big presence on campus. We also help students in the wider Northwestern community learn about Islam from their peers. How do you create that space for dialogue? We have weekly meetings that are open to everyone. We have speakers come and talk about issues that are relevant to Muslim students, like maintaining spirituality in college. We try to bring in diverse voices, like basketball player Kareem Abdul-Jabbar and Academy Award-winning filmmaker Sharmeen Obaid-Chinoy, who can provide interesting content for the wider community to learn about Islam and what it’s like to be a Muslim in the public eye. Have you found support from non-Muslims at Northwestern? Definitely. We often see our non-Muslim peers and professors at a lot of our big events, and we’re happy that McSA can provide a space for them to engage with Islam in an interesting, positive way. What are some practical issues that you have been working on? We’ve been working to open a prayer room in Tech, because a lot of our constituents are pre-meds and engineers and that’s where a lot of them are all day. Our project came to fruition at the end of February, when administrators were able to set up a room for us. The McSA is very grateful for that. What do you want to convey to the Northwestern community? We want to reinforce that McSA is a place for you, even if you don’t come to our meetings or you only come once a year. We also want to emphasize that Muslim Americans are still Americans. We belong here, we were born here, we were raised here. And we have a lot to provide the wider Northwestern community and the whole country.